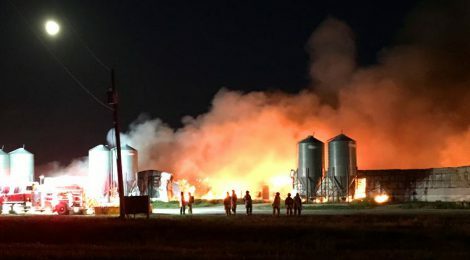 Almost 4,000 pigs burned to death in the evening hours of June 8, trapped in a barn in Manitoba. The barn was located in “hog alley” in southeast Manitoba — the same area currently experiencing an outbreak of porcine epidemic diarrhea (PED). The PED virus causes severe dehydration and diarrhea in pigs and is generally fatal to piglets. The disease epidemic continues to grow, now encompassing 13 farms in Manitoba, 12 of which are within the same area. Officials still do not know how the disease is spread but suspect the virus may be airborne. Clean up of a barn after infection is time-intensive and expensive. Only nine of the 23 barns that have been reported infected with PED since 2014 are now considered “presumptive negative”, even years after the event. The timing and location of this most recent barn fire is certainly raising eyebrows, causing many to ask whether producers, faced with an expensive quarantine and clean up, are instead taking their chances with insurance. Because barn fires burn so hot and so fast, little evidence in left, often resulting in a fire being deemed “undetermined’. These fires are paid out by insurance companies, generally in the area of $1-1.5 million for an average sized pig barn. One cannot help but ask why the insurance industry is not questioning the increased frequency and location of these fires. ← Stalls as social enrichment? !